Exploring Kafr Batna’s … Rebel Gas Chambers? Note: Originally posted here at the CIWCL site after a few tries to get it somewhere with a higher profile. I re-posted this article here November 24, 2014 in the hopes of getting more fresh views; as far as I can tell, this story and the report it's based on have not yet gotten the attention they deserve. As a refresher, the “official story” of the August 21, 2013 Ghouta Chemical Massacre is that the x-hundred fatalities * were killed by the nerve agent Sarin, delivered by Syrian government rockets fired into the rebel-held Ghouta region(s) of rural Damascus. By now, this has been seriously challenged; anti-Assad insurgents clearly had a good motive to get their enemies blamed, and increasingly the evidence suggests they would have the means as well. One aspect generally shared by both sides of the blame debate, at least so far, is that the alleged Sarin rockets actually killed the x-hundred; whose copies of the rockets, and whose type of Sarin, remain the foci of dispute. But while those might be the key questions so many take them for, it's worth a mid-sized pause to consider a recent report challenging the entire debate as it stands. This possibly crucial twist is based on an unprecedented visual study of one segment of the massacre - about 100 victims in a certain morgue. This allowed focused findings that, here, strongly suggest death by Carbon Monoxide or Hydrogen Cyanide gas, likely in the basement of the same rebel-held building they were later displayed in. One victim who survived the gas was slaughtered right there in the morgue. That last fact was not quite hidden by a couple of sheets, and yet missed by all researchers until now. But before delving into the details of that startling new material, it's best to review just how solid the "Sarin myth" it challenges really is. Initial “fears” that Sarin was responsible had a political flavor and lacked evidence. But they were soon made near-gospel by the findings of the U.N. investigation led by Swedish expert Ake Sellstrom. His team had arrived in Damascus a day before the Ghouta attack, in part to look into a previous, alleged, rebel gas attack. Their original work interrupted, they were able to visit two sites; the Zamalka district of East Ghouta where several rockets landed, and Moadamiyah to the south, which had a separate alleged Sarin attack at the same time. The Sellstrom team conducted interviews with rebel-selected alleged survivors, collected environmental and biological samples, and then had the samples assessed in OPCW-certified laboratories. As we all know, the “feared” nerve agent turned up, confirmed with science. But less people are aware of the gap in that science at least the size of the massacre itself; the investigators failed to collect a single sample from any of the x-hundred who actually died. Angela Kane (right) to RT's Oksana Boyko: "a dead body can't tell you how the person dies." The real reason for this choice could be speculated on. But obviously the dead didn’t get to do interviews either, and so neither their words nor their bodies were called on. Other people - presumed to be about the same - stood in for them in both regards. This exercise in faith may have an honest outcome, and it may not. In that light, what the Sellstrom team gathered was circumstantial evidence with many possible explanations. For example, Sarin and its degradation products turned up with the Zamalka rockets and impact sites. This could be from the August 21 impacts, either as a main cause of death (as presumed), or just seeded to show up later. Or, it could have been planted at the insurgent-controlled site at any later time. The human samples show that some people in the area were exposed to Sarin; there are ways to fake exposure, but the tests used apparently rule that out. But there’s nothing to say just when and how it happened, other than the accounts they gave. These are made of words, delivered by rebel-screened people. Such words might be true, but there is a Jihad going on and lying to infidels is allowed. Their propaganda-to-plausibility ratio merits some scrutiny. Finally, investigative reporter Gareth Porter recently analyzed the U.N. report and decided the subjects probably had “extremely low” exposure to the agent. If so, that leaves an unexplained gap between the subjects and those who supposedly died all around them. It also makes “voluntary” exposure by Jihadi fakers more plausible than one might think. All these gaps matter when neither common sense nor the visual evidence ever suggested Sarin. Asked how his current views correlate with his early doubts, Kaszeta said by e-mail: “I always thought Sarin was a possibility. But several things erased the uncertainty in my mind.” He cites three points, two being the UN findings (field, and human). He also saw how “other theories and explanatory narratives began to crumble,” sometimes under his own analysis. Asked specifically for anything in the visual evidence, Kaszeta instead pointed to the limitations of video diagnosis (“telemedicine”), and even of the textbook symptoms to compare them to. His points are technically valid, but limited in their relevance. It’s as fair now as it was last fall to note that it just doesn’t look right. Even those who question the government’s guilt tend to see through the same Sarin-misted lens. “Sasa Wawa” of the research blog Who Attacked Ghouta, Gareth Porter, Seymour Hersh, and others focus on rockets filled with the stuff, but the rebels’ improvised version of it (which exists) and fired by the rebels (which is the best reading). But in fact those rockets, and both sides’ Sarin supplies, might be largely – or totally - irrelevant to what happened that night. Even though they landed all around the crime scene, August 21 Sarin rockets probably don’t explain those nine fatalities. But the other small and larger sub-totals, making up the entire x-hundred killed, remain open to question. The most widely seen video (dubbed SM-a) shows at least 80 children, men, and women laid out in close rows in a simple, white-tiled, sun-lit room. Activists mill about between the bodies, collecting blood samples, saying Allahu Akbar, and making their own videos. O-Brien named this the “SunMorgue” of the report’s title. "Compared to the DarkMorgue,” O’Brien writes, the SunMorgue seems “almost cheerful,” mostly from the natural light and that “its occupants are past their final suffering." But one man at least – dubbed victim M-015 - seems to have passed it right there in the morgue. His blood across the floor is evident in video SM-a and elsewhere, but just where it’s coming from only becomes clear with the kind of all-sources study O’Brien did here. If one has followed his exhaustive run-down of each image and each possibility, It’s hard to disagree with O’Brien on this analysis. M-015 was brought in not bleeding, a white cloth over his face, and laid on a blood-free floor with his hands relaxed, laid cross his chest. Later, the face cloth is over his neck, there’s blood everywhere, and the victim has clenched his fists; his right hand is still where it was, but it’s gripping his shirt now. That was the last grasp on life he tried for, it seems, and it was not a helping hand he got back. Consider now the death toll for the Ghouta massacre: 3-500 at the low end, and as many as 1,700 alleged. The entire range is far beyond the usual toll of an alleged CW attack in Syria, with or without enclosed spaces: from zero to around 30 killed. Something employing gas chamber efficiency is suggested here, and this might be a glimpse of that process as it unfolded on the Kafr Batna front. He’s not an expert in assessing the dead, but he at least has enough medical background to know where to look. The “biological mystery” he follows to the molecular level is related in Part C.  It should be noted for the critics that in Kafr Batna, there are high-quality photographs, besides the usual video sources. And in contrast to Ake Sellstrom’s mission, at least this study looks at the alleged Sarin victims that really matter. One of the first things O’Brien noticed was the overall healthy pink color of the victims. This he first took to mean that they might be alive, and briefly pursued a “Juliet hypothesis.” But upon noticing their Pallor Mortis (the paleness of death) and Livor Mortis (the redness of it), that ended. As the heavier red blood cells settle with gravity in the hours following death, lower parts become red and upper parts pale, in an effect that fades within 10-12 hours. He notes many blood samples drawn are just straw-colored plasma, proving that separation and the absence of life. Ante-Mortem Skin Color – Sarin: high incidence of cyanosis, low to nil instance of rubicundity – Observed: very high incidence of rubicundity, no cyanosis observed. Pallor Mortis color – Sarin: Exclusively bluish grey - Observed: red/pink consistently observed w/ minor questionable exceptions. The conclusions, taken together: strongly supports Carbon Monoxide, supports Cyanide, and strongly contradicts Sarin. Nothing here can totally rule out that even these victims - let alone others gassed elsewhere - might have Sarin, trace amounts or higher, included in their engineered last breaths. But this best visual assessment of the KB victims says the basic mechanism of their deaths was of another sort. If in fact insurgents executed the Ghouta victims themselves, then the records they provide – the only ones available – will not be trustworthy. What these say about the SunMorgue victims, for example, probably gives no direct clue why they and their handlers were on such bad terms. It’s a vague but real impression from the morgue videos, best highlighted by the murder of M-015. That was not a friendly action. It could be that these corpses in rebel custody were that way when alive. It’s been presumed that the victims came to this “clinic” from elsewhere, and two nighttime videos show a couple of arrivals. But those might be the only arrivals and filmed for that reason, while most people were there all along. The apparent gender-segregation of death is a chilling clue; a cloud of Sarin vapor doesn’t differentiate like that, but jailers and executioners might. Considering, then, what opposition fighters in Syria sometimes do with their “human resources,” imagine what they might do with those plus access to Sarin, other poisons, rockets, and many enclosed spaces. Imagine that choice being made on the fringes of Damascus, by the anniversary of Obama’s “Red Line” offer, which came just after the UN’s “inspectors” had landed in the capitol. Initial suspicions that the victim videos were filmed in the north is countered by the geo-location of several in East Ghouta, including the SunMorgue. And so the distance issue is a problem for the northern captures theory. But there are quieter abductions, closer to the crime scene, or longer ago in time, that could easily fill a gas chamber system in Ghouta. Recall Angela Kane’s Orwellian inversion of the truth-to-death ratio: “a dead body can’t tell you how a person died,” but a living, insurgent-screened person can be trusted to tell you for them. Rather, like the blood settles after death into that striking livor mortis, so too does the ability to lie settle after death, leaving brutal honesty alone on the surface. The study encapsulated in MITSM reveals the story hidden in plain view, by re-claiming the same sunlight the insurgents used to illuminate these cancelled Human Beings. With the same obvious motive they always had, and evidence of a chemical massacre well within their means, it can't be ethically ignored any longer - the handlers of at least this hundred in Kafr Batna, and their foreign backers, may have lied to us about who and what is to blame. Again, the American threats of force against Syria last year were cancelled only by maneuvers on the world stage, and did nothing to change the perceived truth. The pretext that pushed us there once lingers, awaiting another push. Truth is the best solution to that, but the Sarin myth may be blocking our view of it. In this corner of Hell at least, we now have one cleared view that is brightly lit and should be widely seen. RT October 3, 2013. 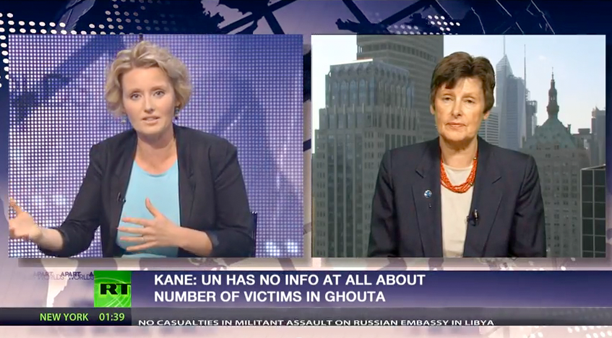 ‘No sarin detected in West Ghouta environment, only in human samples' - UN's Angela Kane. RT video, published October 3, 2013. (time-stamp: 12:29) https://www.youtube.com/watch?v=CcfIj6WLqRkNote: The author asked both Dan Kaszeta and Denis O’Brien what they thought of that. Kaszeta countered (see note 7): “you can tell a lot from a dead body. Principally the same protein adducts that would be analyzed by fluoride regeneration as from a live body. It would have been great to get some bodies and do some testing.” The remarks reminded O’Brien of an “old Mickey Spillane quip” that “dead men don't tell lies.” (e-mail message from Denis O’Brien to the author, April 27, 2014) See also criticism here. ACLOS member Pmr9 cites “fluoride ion regeneration test” (see here). A search indicates that exact name isn’t usually used, but a test like that exists. Dan Kaszeta mentioned “a much newer method, one that forced me back to the library to read up on, called fluoride regeneration or fluoride reactivation.” (see also note 1) Both agreed this rules out the known methods of fakery (like ingestion of IMPA powder) and/or proves actual Sarin exposure. New Data Raise Further Doubt on Official View of August 21 Gas Attack in Syria By Gareth Porter, Truthout, April 29, 2014. Syria: Chemical Weapons Expert Jean Pascal Zanders Says Gas Might Not Be Sarin, Urges Caution By Mehdi Hassan, Huffington Post, August 30, 2013. - Is It Possible The Syrian Rebels (Not Assad) Used Chemical Weapons? by Eyder Peralta, National Public Radio, The Two-Way. August 27, 2013. Note: In the latter, he also warned "we need to keep our minds open that the events of last Wednesday could in whole or partially have alternative explanations." Gareth Porter: See note 3. - Seymour Hersh December 19, 2013: Whose Sarin? - Sasa Wawa, Nov. 2, 2013: The Conclusion. ACLOS: Zamalka/Ghost house The house has been geo-located in Zamalka – someone even marked it on Wikimapia The decay reading is the author’s own, informed by prior study on body decay. See MITSM part A, pages A-4, A-13. Victims of special interest, but not all, are given identifying numbers like M-015. Some are given nicknames, like the girl “Bunny” to whom (along with her playmates) MITSM is dedicated. The gas cylinders are discussed throughout the report, with a new video and discussion about the hissing and the theories on the MITSM discussion page This is still nebulous; no one is even sure yet what the two colors (pale green, bright blue) usually mean in this (Syrian/ international) context. If rockets only hit Zamalka, and winds were to the E-SE, Jobar (west) would be unaffected. In this video, a “Jobar medical point doctor” describes a CW attack on Jobar and Ain Tarma (S-SE) alone. At time-stamp 3:45, as he explains how victims put themselves in basements and started fires, including “burning tires" - "putting tires on fire added insult to injury." He suggests an education campaign to counter that behavior. There have been reports of child victims identified by families in Latakia. If true, these would have weight, but no details are provided and the source (an activist nun) is of sporadic reliability. Amateur attempts are worth trying, but all so far are inadequate for an issue of this gravity. SeeACLOS: Latakia connection? See also the MITSM discussion page. – O’Brien pans some attempts.